This is a fine 1835 map of the Mediterranean Sea and vicinity by the important American mapmaker T. G. Bradford. Centered on the Mediterranean Sea, it covers from Denmark south to the Sahara Desert and from the Atlantic Ocean to Syria in the east. It notes important cities throughout and depicts the boundaries of most of the European counties and territories. Rivers, islands, mountains and a host of other topographical features are noted. This region is known for the terrible pirates who, for centuries, terrorized the Western Mediterranean. The Barbary Pirates would attack trading ships passing through the narrow Gibraltar straits and western Mediterranean. Ships would be destroyed or appropriated, cargo sized, and the crews and passengers enslaved. By the early 19th century, piracy in this region had become so intense that the United States launched its first major naval offensive against Tripoli. Frances tenuous conquest of Tunisia and Algeria in 1830 finally ended the threat of the Barbary Corsairs. The map was published as plate no. 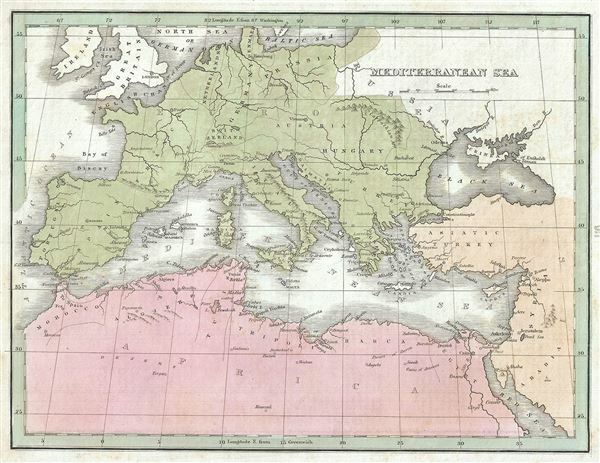 116 in Thomas G. Bradford's 1835 Comprehensive Atlas Geographical, Historical and Commercial. Bradford's atlas, published in 1835 was an important work on many levels. First, it was one of the first American atlases to follow an encyclopedic format, offering readers extensive geographical and statistical tables to supplement the maps themselves. Second, it was published in Boston and influenced the city's rise as a publishing center later in the 19th century (at the time most publishing in the United States was restricted to New York and Philadelphia). Third, this atlas was the first to contain a separate and specific map showing the Republic of Texas. Fourth and finally, Bradford's atlas in some instances broke the Euro-centric mold regarding atlas production. Among other things, Bradford focused his atlas on the Americas and abandoned the classical decoration common in European atlases in favor of a more informational and inherently American approach.